Shenzhen General Hardware and Plastic Product Co. has a strict quality control policy. It is our goal to delight our customers by exceeding their expectations and not merely meeting their needs. We work to be respected by our clients as a reliable and reputable company that provides superior plastic mold solutions and services. What’s more, our products of LED flood light fixture and housing come at very affordable prices for you. We are a superior manufacturing company and supplier of LED lights in China. We uphold our well-earned reputation through the affordability and durability of our high quality products and processes. OurLED flood light fixture like all our other products is a result of consistent compliance with quality principles and practices. We make it a point to listen to our customers and understand their needs completely. This is our way of honestly and promptly communicating with our customers. We offer only professionally designed and reliable molds. This we do by using our unique three-dimensionalcomputer-aided designing technology. Our company is in constant upgrade of our in-process quality control, paying attention to every manufacturing detail. The competency skills of the people behind Shenzhen General Hardware and Plastic Product Co. are constantly developed through training programs that harness innovation and continued growth. One of our many excellent products is LED flood light housing. Just like all our product lines, it goes through meticulous quality control. To ensure quality and durability, each and every manufactured product is a comprehensive solution on molding service that undergoes ISO9001 application. To ensure quality and precision, our manufacturing process includes the use of projectors and other testing machinery. We have 10 to 19 people on our quality control staff. All the raw materials and component parts of our products are sourced from Europe,US, Taiwan, Hong Kong,Japan, and mainland China. Like all our products and services, the procedure and testing detailsfor everyLED flood light housinginvolve a rigorous process. The inspection process is thorough and detailed. It includes self-testing at every process stage, as well as product testing bypotential users. Our company’s main testing processes include EDM procession,grinding, andCNC procession. All these stages in the manufacturing process are technologically conducted with the use of state-of-the-art and high precision 3D projector, and conducted by our highly-skilled and technically experienced quality control engineers. An essential element in the security of any kind of industry, factory, commercial establishment, and homes is lighting the area to prevent theft, arson or any other kind of damage. Lighting up the area requires the use of a good quality LED flood light fixture which has the capability to withstand the problems of weather. 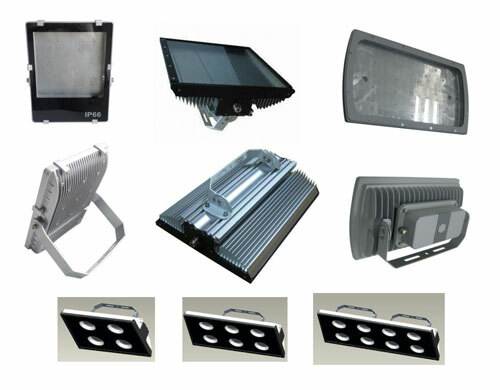 This lighting system is usually manufactured by aluminium extrusion and Shenzhen General Hardware & Plastic Product Co use this process to make the LED flood light housing pieces. While they have their own designs, clients can also specify their own designs to be manufactured at their factory. Aluminum being a very malleable but strong metal is perfect for this fitting. It is for these reasons that Shenzhen GHP use quality aluminum extruded fittings for their flood light housing; this is mainly used in industries, stadiums, street lights, hotels, tunnels, and parking lots, homes, etc. These are available in different designs, and all come with aluminum heat sinks, power fittings, reflectors, and LED or other kind of bulbs, based on individual requirement.